At first glance, the story of Maria de Fátima Portela, 57 years, seems to be alike many others women’s stories. Born in the Northeast of Brazil, Portela, as she is known, came from Maranhão to São Paulo in 1981. Unmarried, with two small children, she settled to live with her brother to start a new life and begun working as cleaner. Portela says this activity brought the needed income to raise the eldest sons and the other two from a second marriage. 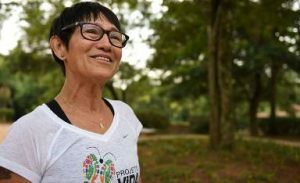 In 2002, after spending years in a routine that made her leaving home at 5 a.m. and return at 10 p.m., Portela found herself tired, depressed and ill. It was at that stage, with thyroid problems and taking a “black label” psychiatric medication that a great turn happened in her life. “A friend, who brought light to me, encouraged me to stroll in a park near home. Gradually, I met other women who invited me to know the Vida Corrida NGO. When I arrived there everything absorbed my attention and I decided to take part” recalls Portela telling that with time she gave up the depression medication. Fourteen years later, the woman who had never done any physical activity now talks about “practice charts” and achievements with the spontaneity of someone who incorporated the routine of physical activity. In fact, when she spoke to us, Portela was in Pernambuco on vacation, but, keeping the daily race. “What about when it rains?”. “When it rains, I go out in the rain,” tells the athlete. 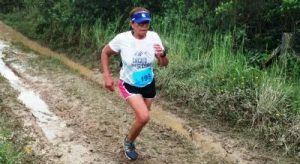 She already took part of São Silvestre (São Paulo) and of Volta da Pampulha (Belo Horizonte) and had just signed up for a race in Caruaru that would happen a few days after our conversation. Portela tells us that the race brought many benefits to her life. “I am always up for everything. Even my working energy has improved. Another thing is that I was very shy. I couldn’t even say “I love you” to others. Today, I talk about my feelings, I have fun. I am a person 100% better. When I retire it will be even better.” In 14 years, Portela never thought about stopping. “Of course it happens to be too lazy to go out for a jog. I turn sides and sleep. But when I wake up and see the sun, I regret missing the activity “, she remarks. The runner knows she inspires other people inside and outside home. Minor grandchildren (she has five grandchildren and a great-grandson) say they want to “run like Grandma” when they grow up. In addition, in the Vida Corrida there is always a youngster showing up: “If this lady does, why wouldn’t I? ‘”. Portela ended up involved in the management of Vida Corrida. “I am part of the Board and will only leave if Neide expels me” she jokes. Neide is Marineide dos Santos Silva, 56 years, founder of the Associação de Moradores da Cohab Adventista, Capão Redondo, southern area of São Paulo and creator of Projeto Vida Corrida.She started practicing sports at the age of 14, had no opportunity to dispute the Olympic Games but became an amateur runner. In 1999, Neide taught running for the first time. The group was formed by six women, grew a lot and nowadays counts 600 persons from 6 years old. “There is no age limit. We had an 80 years old lady runner” she remarks.The runner comments that Sesc and the NGO are partners from the beginning. “The first time I ran in group was at the Sesc Circuit in Interlagos. Since then, we join all activities: Sesc Summer, Move Brasil and Challenge Day “. Neide learned to organize races with the support of Sesc. About Challenge Day, Neide explains that in 2016 the NGO managed to gather more than 3000 people. “We had a long walk and sports court activities. Sesc introduced Yoga and Polo activities for us to meet”. Neide believes that the greatest difficulty is to start and remain in physical activity. For her, what works is to form groups. “I live in a community and understand that people need to get together, to call the neighbor, partner, brother, sister… When the group is growing and people are starting to realize the benefits, they get inspired and continue. In fact, there’s no secret. Starting is the deal. People need to understand that life is not a remote control” she concludes.